Mysterious happenings, a woman with a secret and, of course, a watcher in the woods come together in the 1981 film Watcher in the Woods which, over the years, has grown into a cult classic. Count amongst the film’s fans Melissa Joan Hart (Melissa & Joey, Sabrina the Teenage Witch) who decided to take on the project of remaking the Disney horror film for a more contemporary audience. Director Melissa Joan Hart, along with her mother/producer Paula Hart, screenwriter Scott Abbott, and producer Andrew Gernhard came to San Diego Comic Con to share some stories from set, talk about how the new film will both reflect and deviate from its predecessor, and drop some tantalizing tidbits to encourage everyone to tune in to the film’s premiere on Lifetime, October 21st (just in time for Halloween!). Premise: The story picks up when Jan (Tallulah Evans) and her sister, Ellie (Dixie Egerickx), move with their family to the English countryside into a home owned by a woman whose daughter disappeared 20 years earlier. 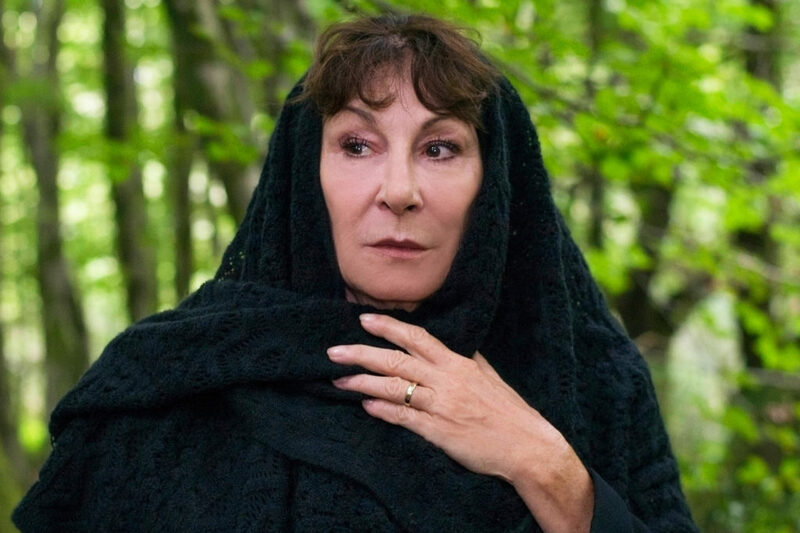 The family is warned about the odd behavior of the woman, Mrs. Alywood (Anjelica Huston), and the forest that surrounds the home and, as the story progresses, Jan is drawn further and further into strange happenings and a mysterious force that seems to be watching from the woods. One big distinction between this remake and the original film is the genre (or perhaps sub-genre) you might put it in. For the 2017 version, expect less sci-fi and more gothic horror; less aliens, more ghosts. The goal of Scott Abbott’s (screenwriter) was to take the element of suspense done so well in the original and give it a “modern suspenseful sheen for an audience that is much savvier.” To do this, he put a great deal of thought into the questions of who the watcher is, what they want, and how that would be scary for an audience today, believing that these questions will drive the movie and lead to a more satisfying ending than in the original (just watch the original and its alternative endings… you’ll see). To help determine what scare tactics might still work, Melissa watched the 1981 version with her ten-year-old. One technique that still works today? “Using the camera as the point of view and using that point of view to sort of scare the crap out of you.” Abbott added that in this film, the woods are very much a character in and of themselves and this reflects more how it was in the book upon which the original movie was based. With the original film being such a fan favorite for Melissa, beyond the basic plot, there were a few key elements that absolutely needed to be included in the remake. These include the pond scene with Jan and Mrs. Alywood (so crucial that they had to manufacture a pond to get it just right) and the Narek character who takes on a bit of a different form than in the original film where he was a dog. Abbott also mentions the continued importance of mirrors and how they “portend upcoming unhappiness.” Also, like the original, this film takes place in the UK (unlike the book which is set in New England). There are a few elements taken from the book as well, including the importance of the tree next to the pond and a few character quirks like Ellie scratching her knees and Jan playing with her necklace. One of the coolest distinguishing features of this film is that it travels to different places and times. When running through the budget, Paula thought they were going to have to cut out any flashback scenes because the costuming and makeup were too expensive to procure. However, they happened upon a costume shop in the UK that specialized in carrying pieces from just about any time and place… a shop utilized primarily by the popular time-traveling show, Doctor Who. Problem solved! For each new time the film has a unique feel. This is due, in large part, to the varying color schemes used in the filming. For example, the modern-day England has a warm tone, the 1300s are black and white, and the 1980s are toned sepia. This film even takes the audience to a different world, a blue world, which Melissa would like to point out, they shot before the show Stranger Things came out (although she does admit that there are striking parallels between this aspect of her film and the hit Netflix series). Although mostly lost in the process of translating the script to the screen, this film still carries the essence of an idea originally formulated by Abbott, that of using a language of flowers. The concept was taken from medieval times when people would leave coded messages using all types of flowers. The initial concept ended up being too complex to carry out, but you still might catch a whiff of it here and there if you pay attention. Taking on Bette Davis’ role of Mrs. Alywood, the mother of a woman who disappeared, is none other than Academy Award winner Angelica Huston. The task of casting that role could have been quite daunting, but the Harts were successful in getting the name on the top of Paula’s wish list. Interestingly, Huston was the only American even considered for the role (the rest of Paula’s list consisted of lesser known English actresses). Melissa was initially concerned about directing such a powerhouse, but was put at ease after their first phone call during which Huston was “a doll.” Melissa mentioned that Huston brought to the set a consummate preparedness and some great ideas about costuming and her character’s backstory. Paula beamed with pride at her daughter’s accomplishment saying that it was a real feather in Melissa’s cap to direct an Academy Award winner. Whether you are a fan of the original movie, source book, or just looking for a bit of a fright this Halloween, you’ll be sure to get something from this new Lifetime movie brought to you by Melissa Joan Hart and Hartbreak Films, debuting 8 p.m. on October 21st. Watch out!